Product #6264 | SKU MID-204 | 0.0 (no ratings yet) Thanks for your rating! Hosa Dual MIDI Cable (4m). This cable is designed to interconnect MIDI devices. Each lead is wired 5-pin discrete and color-coded for easy identification. The MIDI protocol allows communication between a computer and a digital synthesizer (keyboard, drum machine, etc.) by transmitting how the notes are to be produced. For example, commands like note-on, note-off, pitch-shift, and tempo create much smaller files and more realistic music, relying on the synthesizer to create all audible sounds. 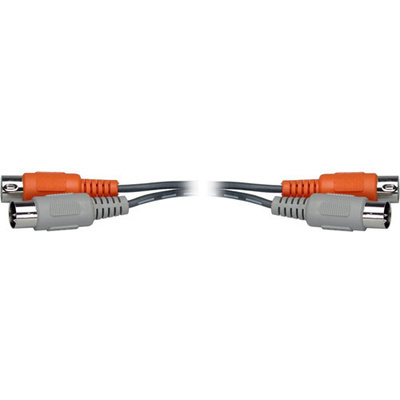 This tandem MIDI cable allows sending and receiving MIDI information through one cable assembly. Red and white color-coded connectors differentiate between cables, making hookups easier. Each of the five pins on the connectors of these MIDI cables are wired to support all MIDI functions, including uploading and downloading data and relaying SysEx information. The injection-molded connector bodies with built-in strain relief are rugged and affordable, and the stranded copper conductors are surrounded by a dense copper shield to ensure interference-resistant data transfer.